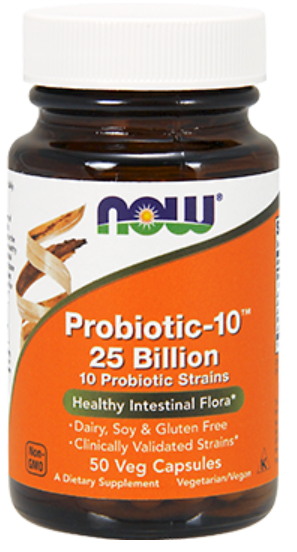 NOW Probiotic-10: Multispecies Probiotic Supplement. Is It For You? NOW Probiotic-10: Ten Strains Making It 10 Times Better Than Others? NOW Probiotic-10 is a multi-species probiotic supplement containing 10 different strains of lactic acid bacteria. It is marketed to have clinically validated strains for healthy intestinal flora. Note that this product differs from the “Probiotic-10, 24 packets” label in the total CFU, the order of strains included and the other ingredients. This product is available in 3 strength: 25, 50 and 100 billion. This review is for the 25 billion product. The other ingredients at the time of this writing (April, 2016) are cellulose powder, cellulose (capsule), FOS (fructooligosaccharides), ascorbyl palmitate and silica (flow and anti-caking agent). Ascorbyl palmitate is a synthetic lipophilic (fat-soluble) derivative of ascorbic acid that is used as an antioxidant. Please always verify ingredients of any supplement before taking it! The recommended dosage is 1 capsule 1 to 2 times daily between meals or on an empty stomach. I personally believe that you should take probiotics with at least some food or drink to buffer the low pH from stomach acid in an empty stomach. What Are the Pros of NOW Probiotic-10, 25 Billion? Strains are known to be acid-resistant and bile resistant and have been genetically characterized. All of the strains have in vitro research, and some of them have animal and human studies, too. The strains originally are from human, dairy, plant or unknown sources. The Lactobacillus bacteria all showed good to excellent inhibition of 4 pathogens, in vitro. The mix of bacteria show both pro- and anti-inflammatory actions. Produced in a GMP facility that processes other ingredients containing these allergens, however, so that may be a concern if you are sensitive to any of those items. As part of their GMP processes, specification sheets, or spec sheets, are created, maintained and updated for all single raw materials, mixtures, capsules, tablets, softgels and liquid products. Potency is guaranteed through expiration date. Compared to other multi-species probiotic supplements, this one contains a higher than average number of total CFU of 25 billion per capsule. Sold in stores as well as online. What Are the Cons of NOW Probiotic-10, 25 Billion? Only the total CFU is given; you don't know how much of each species is present. It is not possible to speculate what the dominant effects of this supplement may be. No studies with this supplement as a whole supplement have been performed to my knowledge. This is not unusual, however. Very few multi-species probiotic supplements are used in studies. Instead, species and strains that are show to be effective are mixed together in most multi-species supplements such as this one. It has an undisclosed amount of FOS (fructooligosaccharides) which could pose problems for people who are on a FODMAPS diet. Where Can You Find NOW Probiotic-10, 25 Billion? NOW, like many other manufacturers, adds extra CFU in the product to make sure it has at least 25 billion by the expiration date if kept in recommended conditions. A notice about product stability on their website states, “In testing designed to mimic exposures during transportation in a hot climate, a sealed probiotic formula exposed to a temperature of over 122° F for 24 hours still met label claim for CFU content. This indicates that this level of heat over that time period was not enough to kill many of the organisms in the package, so it would take even harsher conditions to rapidly degrade the potency of this specific probiotic product.” While this may be true, note that they did not specify which product was tested so it may or may not apply to this product. For maximum potency, either have NOW Probiotic-10, 25 billion shipped cold from a seller who stores it cold, or have it shipped from a seller who stores it cold and then ships it during colder months in which it will not be exposed to warm temperatures anywhere along the way. My dispensary, Wellevate, where you can get a discount and have access to numerous quality products. Wellevate stores and ships products properly. Vitacost.com and it is shipped with a cold pack. Amazon.com I would be careful purchasing here unless the retailer says that the product is kept cold and/or shipped cold. Is NOW Probiotic-10, 25 Billion the Right Probiotic Supplement for YOU? Many of the same strains are in the Healthy Origins product, but at a total lower dosage. NOW Probiotic-10, 25 billion is a high potency supplement, has "safe" species of Lactobacillus and Bifidobacterium and has the strains identified. Thanks to Christine for suggesting a review of this supplement!